One of my many short to medium term geocaching targets is to find caches in each of Sweden’s twenty one regions. It has been on my list of targets since 2014 and was nearly achieved that year. I made a trip up to Umeå but ran out of steam due to poor weather and didn’t drive the extra couple of hundred kilometers to get to Norrland. See Västerbotten. A long term target is to find a cache in each of Sweden’s counties, but the process is slow as Sweden is a fairly large country. Last year I even booked hotels in Umeå and Luleå for a planned trip that got washed out at the last moment. However, this year I made it. 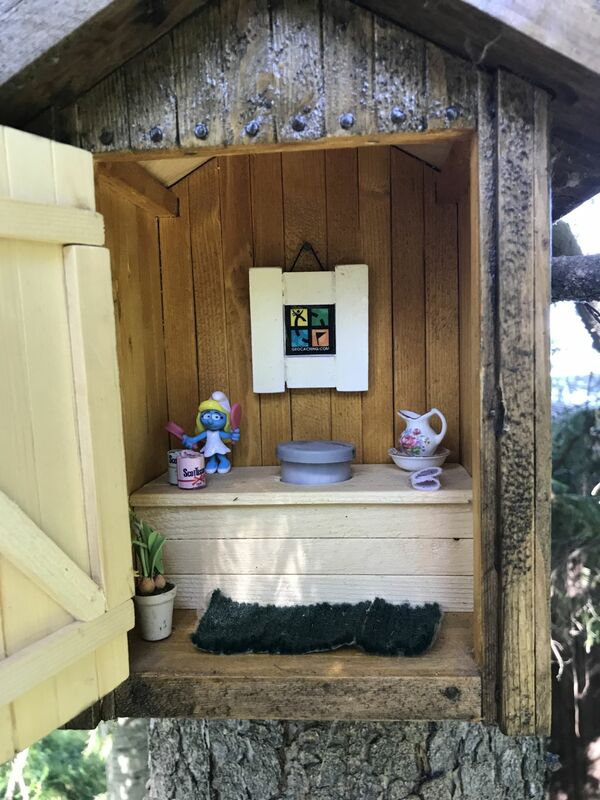 As I had my muggle partner with me I knew that there would be nowhere near as much geocaching as I would have liked but I am happy to find a cache or two in each new county that we visit. (In this post I will use Region and County as done on geocaching.com but actually prefer to talk about County and Borough as done in GSAK). My original plan was to drive up through the inland of Sweden then back down the coast road (E4). At a later stage in the planning I reversed the route as I thought it might be quicker to get to the far north on major roads rather that the smaller roads in the inland. As I have found caches in most counties up to Umeå that was the first overnight stop, two in fact, so that we could explore the town at a sedate pace. Of course, not geocaching whilst in Umeå meant I had a couple of other geo-locations games to fall back on. Ingress and Wallabee. In the latter a good many really low numbered cards were dropped in a small area of Umeå and I should have got up there in 2013 to pick them up but waited until 2014 by which time the best ones had already gone. There were still a fair number there now so I picked up a couple of dozen to trade on. 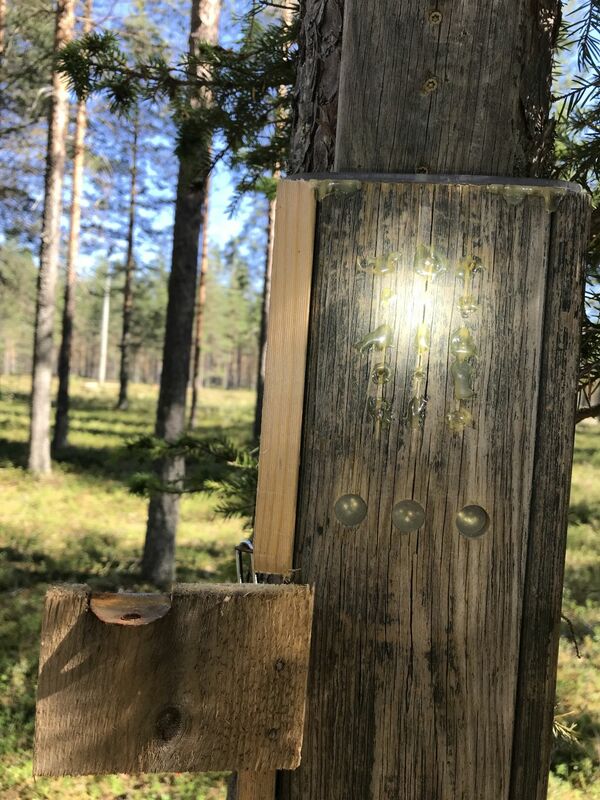 Geocaching started in the county of Robertsfors, still in Västerbotten, with Tövalite. From there we made a short hop up to Lövånger where we had a look around the old church village and church then grabbed a cache by the canal joining two lakes together. 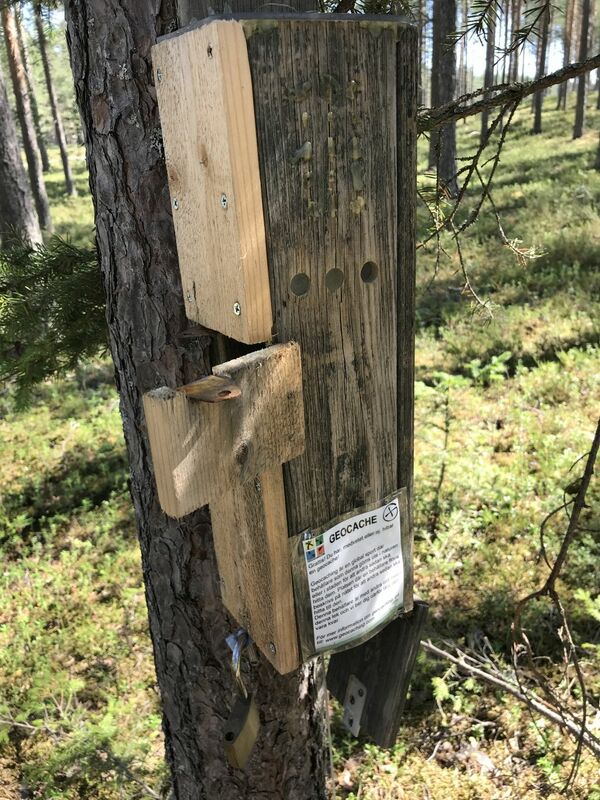 This was my first find in the county of Skellefteå and the first find in Norrland, the last region needed to have found a cache in all of Sweden’s twenty one regions. If the goal had just been to find a cache in Norrland, we could have turned round here and headed for home, but we wanted to see more of the north. The second cache was Utedasset which was the most favourited cache of the ones I visited. The county of Piteå was next on the agenda and we spent a while in the town centre after finding a cache I was very curious about namely RACER copy light v1.1. This was a really ingenious cache so if you don’t want to spoil the fun jump down the page a paragraph or two. I had guessed traffic lights and here we found three ”lights” in a roughly made wooden container. Shining a torch on the front of the cache lit up small points on the bigger ”lights” that gave the numbers needed to unlock a code padlock. There is a long power trail near Piteå so if I had been on my own or with geocaching friends some or all of that would have been on the agenda. As it was now, I was content to find the favourite cache in Piteå and Tribute to “Tredje gången gillt” which was just a few meters from where I had parked the car. We walked around town with an obligatory ice cream as the temperature was around 28C. I was able to relieve some memories of Piteå from when I was a frequent visitor at the beginning of the 1980’s. From Piteå we carried on to Luleå which was our next overnight stay. Once we found a suitable place to park the car for the night and had checked into the hotel we went out for dinner and found Quiz! 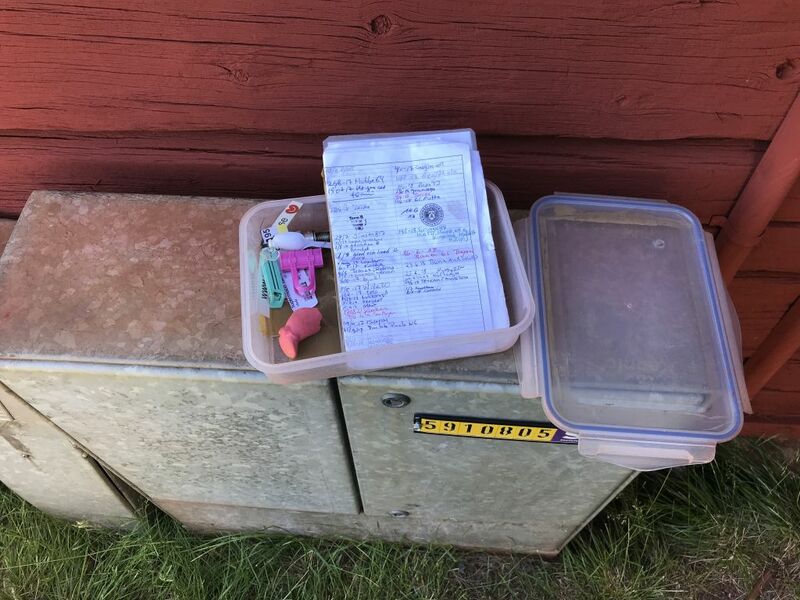 Vilken geocachartyp? – Vägskyltscacharen which was a straightforward trad but in a well camoflagued container then the Letterbox/Hybrid cache Festlig fanfar! 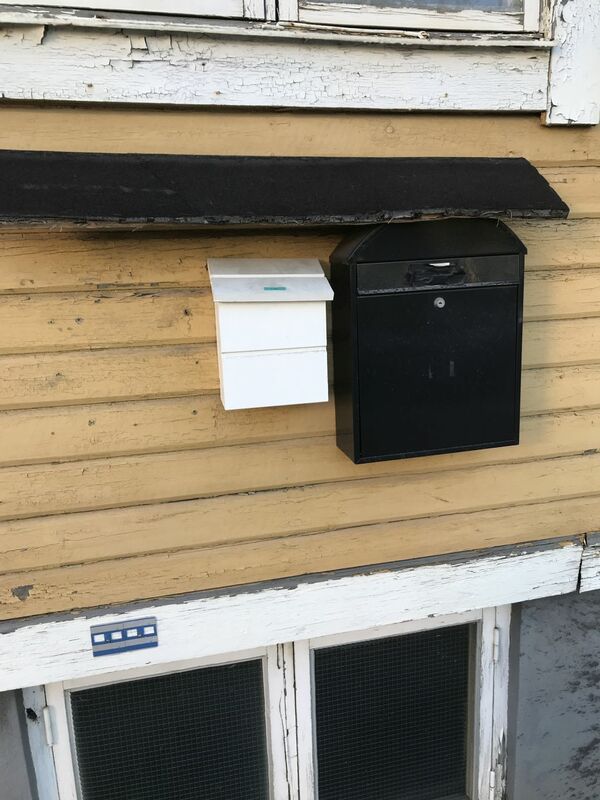 That was a fun cache that took us around a few streets in central Luleå to a real letterbox where the cache was hidden. Final destination for Festlig Fanfar!